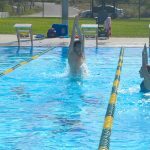 Past Clinic: Butterfly and Breaststroke like a BEAST! Within 250 miles of Haverhill, MA. Get ahead of the competition at this High Performance Swim Clinic focusing on a faster technqiue in butterfly, breaststroke, and open turns. Find the right technique for YOU to maximize your performance with National Champion in butterfly Tom Luchsinger and World Championships medalist in breaststroke Laura Sogar! 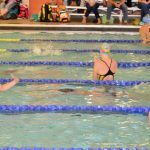 This clinic is designed to help swimmers learn the details of high performance technique while building on their love for the sport! Maximize your speed, power, and efficiency by learning from two of the fastest swimmers in the country! BUTTERFLY: Butterfly does NOT have to be the hardest stroke. Learn the proper timing and technique that will allow you to swim butterfly relaxed and fast! Tom Luchsinger is a National Champion in the 200 butterfly. He will help swimmers understand what it takes to swim a better butterfly. BREASTSTROKE: The fastest breaststrokers in the world have worked their whole lives to refine their technique so that they can swim breaststroke with power, speed, and efficiency. Accelerate your learning process by hearing from Laura Sogar, a breaststroke champion, on what she thinks about when she swims breaststroke and what drills she does to perfect her technique! OPEN TURNS: Carry your momentum THROUGH the turn by learning faster technique from Laura and Tom! Instead of turning around, flip backwards by keeping your chin tucked as you drive your knees into your chest. Push off with power and explode into your streamline. The turn is one of the most missed opportunities to drop time. You won't believe how much you will improve after learning this skill! ASK QUESTIONS: Swimmers and parents are invited to ask Laura and Tom questions during a Q&A session. Gain insight into their training regimen, diet and nutrition, and recovery tactics. WATCH THE CLINICIAN: Observe Laura and Tom swim at full speed and demonstrate a progression of perfectly executed drills to achieve powerful, efficient and fast swimming. Take a photo while wearing Laura and Tom's medals, get autographs, and a gift from TYR Sport!